Albany County ( /ˈɔːlbəni/ AWL-bə-nee) is a county in the state of New York, in the United States. Its northern border is formed by the Mohawk River, at its confluence with the Hudson River, which is on the east. As of the 2010 census, the population was 304,204. The county seat is Albany, the state capital. As originally established by the English government in the colonial era, Albany County had an indefinite amount of land, but has had an area of 530 square miles (1,400 km2) since March 3, 1888. The county is named for the Duke of York and of Albany, who became James II of England (James VII of Scotland). After England took control of New Netherland from the Dutch, Albany County was created on November 1, 1683 by New York Governor Thomas Dongan, and later confirmed on October 1, 1691. The act creating the county vaguely defined its territory "to containe the Towns of Albany, the Collony Rensselaerwyck, Schonecteda, and all the villages, neighborhoods, and Christian Plantaçons on the east side of Hudson River from Roelef's Creek, and on the west side from Sawyer's Creek (Saugerties) to the Sarraghtoga." The confirmation declared in 1691 was similar but omitted the Town of Albany, substituted "Mannor of Ranselaerswyck" for "Collony Rensselaerwyck", and stated "to the uttermost end of Sarraghtoga" instead of just "to Sarraghtoga". Livingston Manor was annexed to Albany County from Dutchess County in 1717. Albany's boundaries were defined more closely as various state statutes would add land to the county, or more commonly subtract land for the formation of new counties. In 1772 with the creation of Tryon and Charlotte counties, Albany gained definitive boundaries and included what are now Albany, Columbia, Rensselaer, Saratoga, and Schenectady counties; large parts of Greene and Washington counties; and the disputed southwest corner of Vermont. On June 26, 1781, Bennington County, Vermont attempted to annex a portion of Albany County that today includes portions of Washington and Rensselaer counties to form what they called "The West Union". The fledgling United States – under the Articles of Confederation – arbitrated this annexation, and condemned it, resulting in Vermont ceasing the annexation on 1782-02-23. The terrain of the county ranges from flat near the Hudson and Mohawk Rivers to high and hilly to the southwest, of the Helderberg Escarpment and the Helderberg Mountains. The highest point is one of several summits near Henry Hill at approximately 2,160 feet (658 m) above sea level; the lowest point is sea level along the Hudson. Albany County itself owns the largest venue for performing arts in the county, the Times Union Center, which was originally built as the Knickerbocker Arena; it opened on January 30, 1990 with a performance by Frank Sinatra. In 1996, The Grateful Dead released a concert album from their March 1990 performances titled Dozin' at the Knick. On January 1, 1968 a 39-member County Legislature was established. On January 1, 1976, Albany County government was changed by a new county charter establishing provisions for a county executive elected at-large, in addition to the 39-seat county legislature. Each of the 39 members are elected from single-member districts. As of 2015, the county council has 29 Democrats, 9 Republicans and 1 Conservative, who caucuses with the Republicans. ^ "Population and Housing Unit Estimates". U.S. Census Bureau. August 15, 2017. https://www.census.gov/programs-surveys/popest.html. Retrieved August 15, 2017. ^ a b "State & County QuickFacts". United States Census Bureau. Archived from the original on July 6, 2011. https://www.webcitation.org/5zyi6l51w?url=http://quickfacts.census.gov/qfd/states/36/36001.html. Retrieved October 11, 2013. ^ George Howell and Jonathan Tenney (1886). Bi-Centennial History of Albany. W.W. Munsell. p. 12. https://books.google.com/?id=HGkJAQAAIAAJ&printsec=frontcover&dq=history+of+albany+county&q=. Retrieved 2009-08-28. ^ a b George Howell and Jonathan Tenney (1886). Bi-Centennial History of Albany. W.W. Munsell. p. 70. https://books.google.com/?id=HGkJAQAAIAAJ&printsec=frontcover&dq=history+of+albany+county&q=. Retrieved 2009-08-28. ^ a b c George Howell and Jonathan Tenney (1886). Bi-Centennial History of Albany. W.W. Munsell. p. 71. https://books.google.com/?id=HGkJAQAAIAAJ&printsec=frontcover&dq=history+of+albany+county&q=. Retrieved 2009-08-28. ^ a b c David Kendall Martin (Fall 1990). "The Districts of Albany County, New York, 1772–1784". The New York Genealogical and Biographical Society. http://www.newyorkfamilyhistory.org/modules.php?name=Sections&op=viewarticle&artid=72. Retrieved 2009-08-30. ^ George Howell and Jonathan Tenney (1886). Bi-Centennial History of Albany. W.W. Munsell. p. 72. https://books.google.com/?id=HGkJAQAAIAAJ&printsec=frontcover&dq=history+of+albany+county&q=. Retrieved 2009-08-28. ^ French, John (1860). Gazetteer of the State of New York. R. Pearsall Smith. 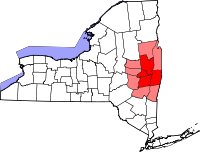 p. 598. https://books.google.com/?id=R_zHwh4xByQC&printsec=frontcover&dq=gazetteer+new+york#v=onepage&q=saratoga%20county. Retrieved 2009-08-30. ^ "Albany County". New York State Museum. http://www.nysm.nysed.gov/albany/albanycounty.html. Retrieved 2009-08-30. ^ (state), New York (1788). Laws of the State of New York. State of New York. p. 748. https://books.google.com/?id=GBWxAAAAIAAJ&pg=PA748&dq=an+act+for+dividing+the+counties+of+this+state+into+towns&q=an%20act%20for%20dividing%20the%20counties%20of%20this%20state%20into%20towns. Retrieved 2009-08-31. ^ "Monthly Averages for Albany, NY". Ustravelweather.com. 2008. Archived from the original on 2008-06-11. https://web.archive.org/web/20080611112348/http://www.ustravelweather.com/weather-new-york/albany-weather.asp. Retrieved 2008-09-26. ^ a b "Climate information for Albany, New York". climate-zone.com. Archived from the original on 11 May 2009. http://www.climate-zone.com/climate/united-states/new-york/albany/. Retrieved 2009-06-06. ^ "Cloudiness". University of Utah, Department of Atmospheric Sciences. Archived from the original on March 26, 2009. https://web.archive.org/web/20090326080816/http://www.met.utah.edu/jhorel/html/wx/climate/cldy.html. Retrieved 2009-06-06. ^ "Sunshine Hours Page". Archived from the original on 15 May 2009. https://web.archive.org/web/20090515033306/http://www.thewellers.com/weller43/sunshine.htm. Retrieved 2009-06-06. ^ "Architecture". http://www.docstoc.com/docs/4936290/ARCHITECTURE-Architecture-ALBANY-COUNTY-If-architecture-is-your-passion. Retrieved 2009-08-26. ^ "Albany Tulip Queen". Albany Tulip Queen.com. Archived from the original on 19 May 2009. http://www.albanytulipqueen.com/. Retrieved 2009-06-07. ^ "About Albany Latin Fest". Albany Latin Festival. Archived from the original on 16 June 2009. http://www.albanylatinfest.com/about.html. Retrieved 2009-06-08. ^ International Council of Shopping Centers Script error Shopping Center Definitions for the U.S. Information accurate as of 2004. Retrieved February 20, 2007. ^ "Enjoy the Albany/Capital District on snowshoes". Albany.com. http://www.albany.com/winter/snowshoeing.cfm. Retrieved 2009-06-09. ^ Campbell, Jeff (2008). USA. Lonely Planet. p. 184. ISBN 978-1-74104-675-5. https://books.google.com/?id=JwvE1F2zyXoC&pg=PA184&dq=smallbany#PPA184,M1. Retrieved 2009-06-01. ^ "America's Top Cities for Culture". Move, Inc.. http://www.move.com/new-homes/real-estate-news/the-top-10-cultural-cities.aspx. Retrieved 2009-06-04. ^ "The History of the Albany Institute of History from the 1700s to the Present". Albanyinstitute.org. 1999-06-01. Archived from the original on 2012-02-29. https://web.archive.org/web/20120229200707/http://www.albanyinstitute.org/HTML/history.htm. Retrieved 2012-04-29. ^ "Support the New York State Museum". New York State Museum. Archived from the original on 2009-06-03. https://web.archive.org/web/20090603205328/http://www.nysm.nysed.gov/membership/. Retrieved 2009-05-30. ^ "About Us". Albany Center Gallery. http://www.albanycentergallery.org/about/. Retrieved 2009-11-25. ^ "Empire State Plaza Art Collection". New York State Office of General Services. http://ogs.ny.gov/ESP/CT/Art.asp. Retrieved July 24, 2012. ^ "Dozin' at the Knick". Dead101.com. http://www.dead101.com/1045.htm. Retrieved 2012-04-29. ^ "U.S. Decennial Census". United States Census Bureau. Archived from the original on May 12, 2015. https://www.webcitation.org/6YSasqtfX?url=http://www.census.gov/prod/www/decennial.html. Retrieved January 3, 2015. ^ "American FactFinder". Factfinder.census.gov. http://factfinder.census.gov/servlet/DTTable?_bm=y&-context=dt&-ds_name=DEC_2000_SF3_U&-mt_name=DEC_2000_SF3_U_PCT016&-CONTEXT=dt&-tree_id=. Retrieved 2012-04-29. ^ a b "About Tech Valley". Tech Valley Chamber Coalition. Archived from the original on 2008-11-03. https://web.archive.org/web/20081103032600/http://www.techvalley.org/Pages/Live/About%20Tech%20Valley.html. Retrieved 2009-09-27. ^ Larry Rulison (July 10, 2015). "Made in Albany: IBM reveals breakthrough chip made at SUNY Poly". Albany Times-Union. http://www.timesunion.com/news/article/Made-in-Albany-IBM-reveals-breakthrough-chip-6376816.php. Retrieved July 12, 2015. ^ Keshia Clukey (June 27, 2014). "Better than advertised: Chip plant beats expectations". Albany Business Review. http://www.bizjournals.com/albany/print-edition/2014/06/27/better-than-advertised-hip-plant-beats.html. Retrieved July 20, 2015. ^ "Capital District Transportation Committee". Capital District Transportation Committee. http://www.cdtcmpo.org/whatcdtc.htm. Retrieved 2009-04-23. This page uses content from the English language Wikipedia. The original content was at Albany County, New York. The list of authors can be seen in the page history. As with this Familypedia wiki, the content of Wikipedia is available under the Creative Commons License.